I've been planning to paint the door of Myrtle since I got her home. The door will need to be rebuilt since it's damaged at the bottom, but until then I wanted to do something about the rust showing through. As a disclaimer, I don't know what I'm doing. I have done research, I rely on the Tin Can Tourist and Vintage Holiday Rambler groups, and I pull my knowledge to work from my house renovations and crafting endeavors. So, when it came to painting the door, I pulled from my years of experience painting various items. The door is metal. There's rust. The first thing I did was scrap off any loose paint/rust. Then I sanded down the front and back of the door. Since I didn't want to remove the door from the trailer, I taped off around the door, on the window and on the door knob. I used heavy duty contractor paper around the door to keep the extra spray from getting on the trailer. The paint conditions were pretty amazing yesterday after 5:00 pm. No wind, 60 degrees and no humidity. Next it was time to prime. Since this trailer will be going down the road and exposed to the elements, I went with Rust-Oleum's Automobile Primer. In hindsight, I wish I would have primed the entire door because it makes it easier to get a smooth cohesive look with the top coat (see my bumper paint below), but I just did anywhere that looked like it was rusting or just starting to wear. After I was done with my door, I noticed my bumper was in pretty rough shape. I thought I would just do a quick sand job, paint over it and be done. Then all the paint came off! I think the previous owners may have just used a interior latex paint without any sort of primer, so it flaked right off. I went over the entire thing with a scrapper and ended up getting almost all of the paint off the bumper. After scraping the loose paint off, I went back through and sanded everything (especially any paint that wasn't flaking). I also added a piece of contractor paper to keep the spray paint from getting on my trailer. Since the entire bumper was worn, I gave it one solid coat of primer. I'm glad I painted the entire bumper, because the top coat color went on nice and even. I decided to go with a nice bright yellow if I was going to be redoing the entire bumper. I used Valspar Outdoor spray paint. It's meant to be outdoors all the time. I've had pretty good luck with all my Rust-Oleum and Valspar spray paint projects in my yard. After a couple of winters, nothing is showing wear yet (even paint on plastics), so I'm pretty sure this one will work out pretty good as well. Ideally, an automobile paint would have been better or an enamel. However, they don't have the same color selection as other types of spray paint, so I took my chances with the outdoor spray paint. However, when it comes time to paint the entire trailer, I will be using a good quality automobile paint. On the back of the door, I decided to do something fun. I used a black chalkboard paint. The chalkboard paint covered extremely well. I only used 1 and a 1/4 can to get the entire door painted. Also do you see the random white on the window seal? Also the previous owner's DIY paint job. They painted the black seal with white latex paint. A large chunk of the white paint came off just with painters tape. So I'll be finishing up the job and there will be no white when I'm done. 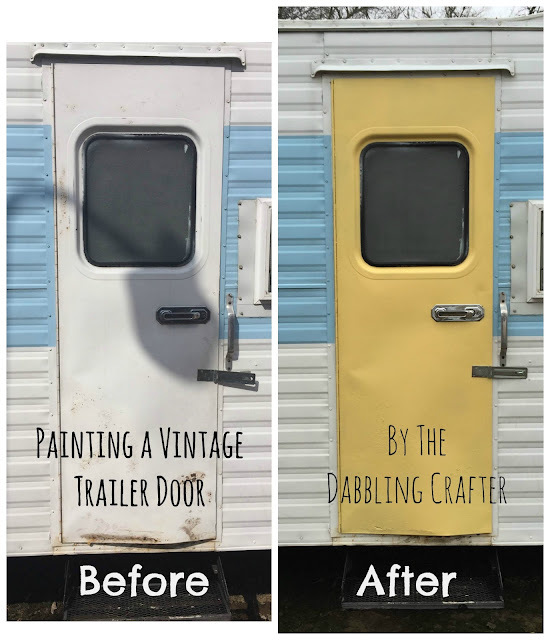 Ideally I would have liked a lighter yellow (this one is pretty bright for my tastes) but it works for now and adds some uniqueness to our vintage trailer. It's made me wanted to tape off that random piece of metal on the side and paint it white so it matches.